The grinding of a food processor. The roar of a welding machine. The soft whir of a blood pressure cuff. These are some of the sounds emanating from high school classrooms in the 37 college and career academies throughout Georgia. Across the state, more than 20,000 students are supplementing their core classes with hands-on preparation for the workplace. The career academy movement came to fruition in 2006 when Lt. Gov. Casey Cagle helped initiate the program under the auspices of the Technical College System of Georgia. Grants of about $3 million each are made available to interested school districts as an incentive to open an academy, which are actually specialized charter schools representing a collaborative partnership between high schools, colleges and local businesses. Since each academy is part of the local school system, the curriculum can respond to the particular workforce needs and resources of the area. The academies emphasize work-based learning and technical training for a seamless transition into the workforce. Students are also encouraged to take advantage of dual enrollment at local colleges or technical schools, in line with Cagle’s vision that every Georgia high school student acquires some post-secondary training before graduating. Popular fields of study include engineering, biomedicine, culinary arts, weld- ing, certified nurse assisting, cosmetology, graphic arts and healthcare sciences. Course work in some fields is designed to teach the skills necessary for industry certification. “Everything we do is above and beyond what we offer in the regular high school, from the labs, the level of equipment, the technology and the commitment we have received from the school system and the community,” says John Uesseler, CEO of the Academy for Advanced Studies in Henry County. That “above and beyond” starts with top-notch physical resources. At the Academy for Advanced Studies, one lab has a full manufacturing line with operable robotics and programmable controllers. At Liberty College and Career Academy in Hinesville, the culinary lab is outfitted as a commercial restaurant; two health labs are equipped with medical beds and manikins; the graphic design department has fully operable screen-printing machines; and the construction and engineering labs include fabrication and 3-D printing equipment. The academies and other schools that offer a Career, Technical and Agricultural Education (CTAE) pathway boast graduation rates of 94.9 percent for students in those programs, compared to 78.8 percent for all Georgia high schools. Local businesses play a key role in this vein. EMC has a lineman apprenticeship program in the works and is excited about the potential for the academies to help fill what he calls a “skills gap” in Georgia’s workforce. Flooring manufacturer Mohawk Industries is doing its part to fill the skills gap at the Gordon County College and Career Academy, where it is supplying a full-time employee to teach the multi-disciplinary field of mechatronics to engineering students to assure instruction is pertinent to long-term employment needs. Liberty Regional Medical Center has opened its doors to allow Liberty College and Career Academy students to shadow professionals in the surgical or labor and delivery wing; students also work with residents at the Coastal Manor nursing home. And at Athens Community Career Academy, students can gain work experience with Caterpillar, Zaxby’s, Eaton Corp. and UGA, among others. But the academies do not exist solely to scoot high school students directly into jobs. “We are doing a disservice to our students in this region to promote the one-size-fits-all college prep diploma,” says Shelly Smith, a former English teacher and CEO of Southeastern Early College and Career Academy (SECCA), which serves Montgomery County High School, Toombs County High School, Treutlen High School and Vidalia Comprehensive High School. At SECCA, automotive services is second in popularity to ROTC; the ROTC instructor travels to each high school in the area to instruct the 180 students enrolled in that program. Stories of the academies’ life-changing effects abound. One SECCA student with behavioral problems interned at the USPET Nutrition plant in Lyons, where he worked in the IT department creating badges and flyers for internal operations. “He realized that when you are in school they have to be nice to you, but that at USPET, as he put it, ‘nobody had to be nice to me; I had to earn it,’” Smith says. USPET subsequently offered the young man a full-time job. Liberty College and Career Academy Senior Caitlin Aughtman starts her school day with regular high school classes, then takes the bus to work as a sous chef in the school’s commercially equipped kitchen that includes a bistro, where students can sell their concoctions and learn how to run a business. Her pumpkin bread recipe has become a hit with family and friends. For students enrolled in the financial career pathway at Henry County’s Academy for Advanced Studies, getting a job can be as easy as walking down the hall. In a converted classroom, Georgia United Credit Union operates the only full-service, fully operational student-managed credit union in the nation. The branch trains students to be customer service reps and tellers, and they are held to the same standards as other employees. They fill out resumes, go through the selection process and undergo professional training. The branch has been so successful that other academies are planning to follow suit. Academies may be preparing students for the workplace, but a firm academic foundation is essential to the training they offer. “It starts to resonate with students who say ‘oh, so this is why I needed to learn that geometry, so when I frame up the house the walls are square,’” says CGEMC’s Arant. Ingram adds that the benefits work both ways: The experiences teach front-level employees how to train and mentor young adults, making a stronger team and boosting morale – at a time when it is most welcome: USPET is rebuilding after a major downsizing last year. The savings come in several forms. Each student receives a laptop computer, and the school system pays for transportation between students’ home high schools and the academy. And students who receive college credit through dual enrollment may be able to enter college as sophomores. Athens Career Academy offers eight career-focused programs, including criminal justice, interior design, early childhood education and mechatronics. Henry County’s Academy for Advanced Studies is also stretching at the seams. After opening its doors in a space shared with Henry County High School, it expanded into a 58,000-square-foot state-of-the-art facility and is now at maximum capacity. To handle the growing enrollment, Henry County High School students will soon move into a new McDonough High School building, while Henry County High School will become the new academy home. Besides facilities, the academies’ ongoing challenge is to stay relevant, prepare students to meet evolving workforce needs and keep pace with technology. This means curricula must remain fluid. “We are seeing a workforce shortage in everything from teachers to welders and construction specialists,” Gambill of Georgia ACTE says. “The consensus from employers is we won’t have a sufficient workforce to pull from when the current workforce starts retiring. Graduates of the academies’ increasingly popular energy pathway will be prepared to fill some of these positions. A new diesel technician pathway that is being developed by the Academy for Advanced Studies in cooperation with construction equipment dealer Yancey Broth- ers will help prepare graduates to fill the growing demand for technicians to work on heavy equipment. Plans are underway in some academies to offer phlebotomy students hands-on clinical prac- tice in drawing blood in cooperation with area hospitals so that they will be eligible to become fully certified phlebotomists. 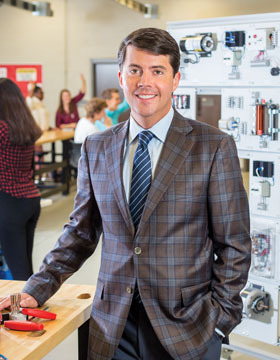 “Every student in the state of Georgia ought to have access to a career academy education,” Arant says. That may soon be a reality. Cagle has expressed a strong desire to make an academy education accessible to all Georgia high school students.